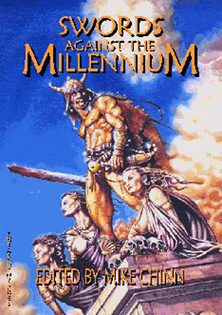 Swords against the Millennium, edited by Mike Chinn, was co-published by the Alchemy Press and Saladorth Productions in 2000. Cover art by Bob Covington; interior artwork by David Bezzina, Alan Hunter and Jim Pitts. Note: Joel Lane’s story was selected for the year’s best anthologies for horror (edited by Stephen Jones) and fantasy (edited by David G Hartwell). Swords against the Millennium was originally published in paperback (£9.95) and as a hardcover, signed by all contributors and limited to 200 copies (£25.00). Swords Against the Millennium is now out of print.